Momentum Play / Momo Play - What Does It Mean? 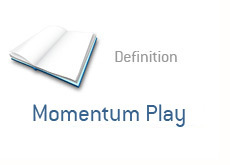 What is a "momentum play"? A momentum play is when you buy or short a stock because the stock is moving big in one direction, and you are hoping to scalp a quick gain if the move continues. 1. XYZ announces positive news, breaks out. XYZ is a small Internet search engine that just announced a major joint venture partnership with Google. XYZ, which closed at $7 the day before, gaps up to $11.50 on the news. The stock has a 52 week high of $13.75. The stock trades higher after the bell, and receives a great deal of coverage in the media. The stock trades up to $13.50 and receives a positive mention on CNBC. You know nothing about the company and nothing about their fundamentals, but you feel as though it will continue going higher. You place a buy order and enter the stock. This is a "momentum", or "momo" play. These types of plays were very popular during the dot-com boom of the late 90s. Traders were watching CNBC like a hawk and just waiting for the next momentum play. They would blindly buy off of a positive CNBC or chat room mention. This is a prime example of a "momo" play.